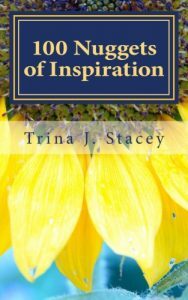 I’m delighted to welcome friend and fellow Devon writer, Trina J. Stacey, to my blog today to share some thoughts and a little poetry. Thanks for inviting me over to your place today Jenny. I grew up on a farm in mid Devon, UK, then left home at 18 to pursue a normal career and eventually discovered it wasn’t for me. At the age of 40, further to living in various parts of the UK and 11 years in Perth, Australia, I heeded the call to return home and now reside in Tiverton with my young family. After several years of sporadically journaling my thoughts, feelings and emotions and attempting to process them, they began to form themselves into poems. This took my simple logical brain somewhat by surprise yet I also had a hunch that my outpourings weren’t meant just for me, so began sharing a few on social media. The responses I received gave me ample confirmation that others were connecting with them too. Apparently I can now call myself a poet and author, something I am both embracing and still coming to terms with. I am also a spiritual life coach and not least a mother of two highly energetic (spirited) children! 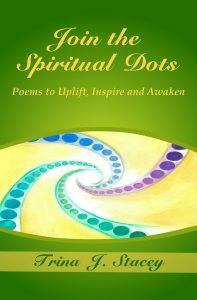 The many twists and turns of my life and consequent spiritual development journey form the basis for the insights that I now share through my poems and in my books Join the Spiritual Dots, Join the Spiritual Dots Goes Deeper and 100 Nuggets of Inspiration. The poems are not intended to be literary masterpieces indeed this is not their purpose. 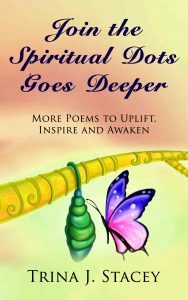 They are authentic, simple and inspiring verses that are accessible to everyone. I meet many writers and poets who have had a long-term love of words. I am a late-developer (in many ways!) and actually believe that what triggered the unlocking of this more creative aspect of myself was a big life challenge I faced during my mid-thirties. At this time I lost everything in a financial sense. 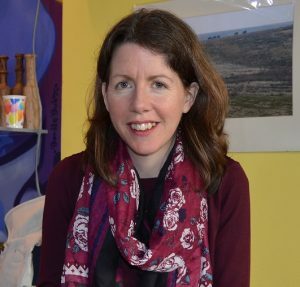 It was a very traumatic time in many ways, but somehow I maintained a strong-belief in something greater at play leading me on, a feeling deep within that there was a bigger role for me to fulfil, inspiring me to simply keep on keeping on in spite of everything that was occurring in my outer world. I am now in immense gratitude for this deeply humbling and life-changing event which prompted me to completely re-define what being successful meant to me. As a result I made a firm commitment to myself to keep following my heart and focus on doing what I love. So by continuing in fear, what are we trying to create? And, What if something magical was on its way to you? To evolve is vital for all of life, so why would we choose to fear?